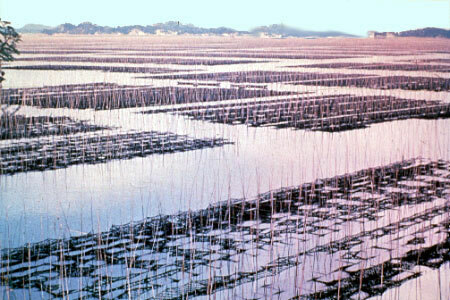 Nori farming in Japan and China is virtually the only case of the large-scale application to mariculture of methods used in agriculture and horticulture; the only other similar large-scale operation being Laminaria cultivation in China and cultivation of Eucheumoid seaweeds around the world. It is a case of full-cycle farming, which does not depend at any time on the caprices of nature - a true case of rational exploitation of a natural resource. It is particularly important to remember that the rearing of the seeding phase- the Conchocelis-phase - in the development of Porphyra is now largely carried out on shore. More consistent results in Porphyra production are ample reward for the trouble taken, and this process now forms a firm foundation for the whole industry. There is less fluctuation in production, leading ultimately to a more stable market and steadily increasing demand. 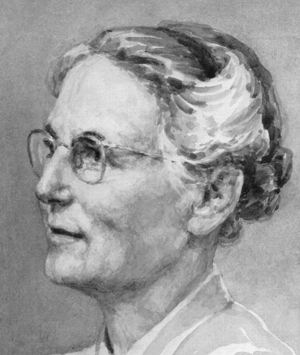 The British scientist Dr Kathleen Drew-Baker (left) of the University of Manchester made the discovery that sparked off the exponential development of the nori cultivation industry in Japan when she established that the life history of Porphyra umbilicalis involves a shell-borning Conchocelis phase. She is remembered by a statue erected by the Japanese nori farmers overlooking the sea at Kumamoto, and each year she is honoured by a small cermony at the site. For the Japanese and Korean nori farmer, prosperity has arrived; in the old days the work was cold, slow and poorly-paid, but now that the industry is highly mechanised, the work is more comfortable, clean and well-paid. It now attracts the younger workers, whereas other fishery industries in which the work is harder and dirtier, have to cope with an increasing recruitment problems. This is said to be the main reason why nori farming partially supplanted oyster farming in Japan. Pollution of inshore waters is one of the greatest threats to the future of the nori industry, although raft farming may help considerably in this regard. 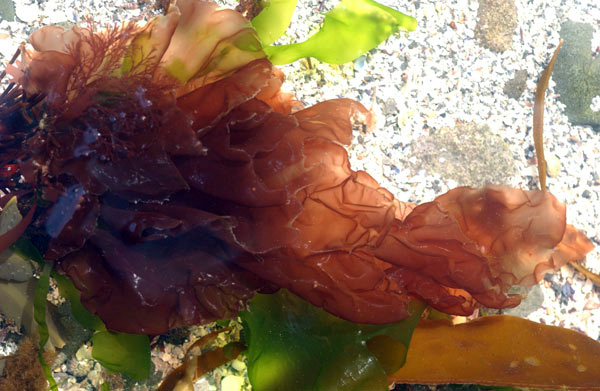 About 150 species of Porphyra are found worldwide (AlgaeBase), of which about 20 grow on the coast of Japan. Two of these, P. yezoensis (left) and P. tenera, are cultivated by the Japanese, and the former is said now to form the bulk of the crop. Intensive selective breeding of both species has taken place in Japan resulting in the development of two vigorously growing cultivars which have been given the names Porphyra yezoensis f. narawaensis Miura and Porphyra tenera var. tamatsuensis Miura. Many of the strains being used are very difficult to identify and, recently, the polymerase chain reaction restriction fragment length polymorphisms (PCR-RFLP) have been used to identify which species is in question with some success. The thallus of the erect frond of Porphyra species is in the form of a flat, lanceolate or broadly elliptical blade. The fronds are composed entirely of either small rectangular or rounded cells which are arranged in one or, more rarely, two cell layers. The plants generally grow up to 35 cm long in the commercially-used species, rarely to l m; they are dark purplish to brownish red. In the wild, Porphyra species normally grow attached to rocks or as epiphytes in the intertidal or shallow subtidal and are generally highly seasonal in their appearance and growth. Porphyra yezoensis normally grows on open coasts in areas affected by cold ocean currents throughout the year whilst the other species that is commonly cultivated in Japan, P. tenera, prefers warmer waters in sheltered, low salinity areas. The transplantation of P. yezoensis to cultivation areas by Nori farmers has largely displaced P. tenera from its former wild habitats. The life histories of both species are roughly the same: the blades germinate from conchospores liberated by the Conchocelis-phase from September to November (short days, relatively low temperatures) and appear as germlings 1 mm in length from mid- to late October, when the water temperature drops to 22°C. The germlings grow rapidly and form blades 15-20 cm or more long by mid- to late November and flourish during the winter at temperatures of 3-8°C. In April, the fronds start to decay and have disappeared by May, when the water temperature rises to 14°C. 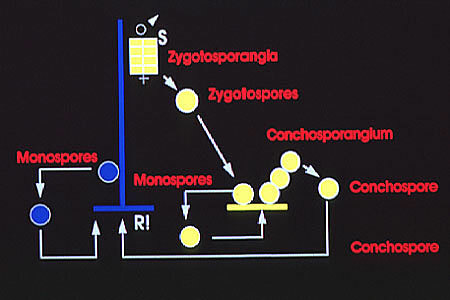 After fertilization, zygotospores are produced and these are used to grow new Conchocelis-phase plants for the next season. A t the end of the growing season (late February to early April) high quality, sporulating Porphyra plants are selected from the nets. 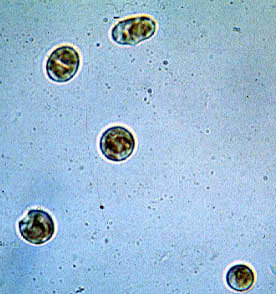 Zygotospores (diploid spores formed by the female gametangial plant; above) are released into a 20-litre container and a suspension is then sprayed onto clean oyster shells using a watering can. About 1 kg of ripe Porphyra is necessary to seed about 20,000 shells. 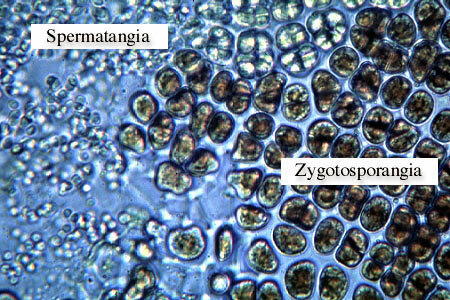 The zygotospores (right, under microscope) germinate best in water of 10-15°C to form unbranched filaments that penetrate into the shells. Microscopic examination is carried out and if enough spores have penetrated the shells, they are then suitable for the next phase. It has been found that the best development of the sporophyte phase takes place when the shells are suspended from ropes (below) rather than lying on the bottom of the tanks (left). Two holes are usually drilled in each shell to make strings of 15 shells, with the tips touching. This is usually carried out at Prefectorial (Japan is divided into local government areas called Prefectures) Seedling Centres, which are government-sponsored and run. The shells are grown indoors in tanks 2 x 3 x 0.7 m deep in which 16 bamboo sticks are placed lengthways, just above the water level, and about 35 strings of shells are hung looped over the sticks. The rooms in which the tanks are placed have windows in the roof and walls, which are provided with curtains to control the light intensity. A Prefectorial Seedling Centre (above) usually has 24 tanks, giving a total facility for rearing about 200,000 shells. The tanks are not aerated but water temperature and light intensity are carefully controlled (above). A rise in water temperature in early summer is desirable and should not drop below 23°C too soon as this stimulates premature spore formation. Photon irradiance should be maintained at about 500 lux (about 10 µmol photons per meter squared per second). Generally, there is no need to change the seawater in the tanks during the summer season, but if water quality deteriorates then it is renewed. The shells and the water usually contain enough nutrients to feed the Conchocelis-phase but small amounts of N and P may be added to stimulate the growth of the alga. 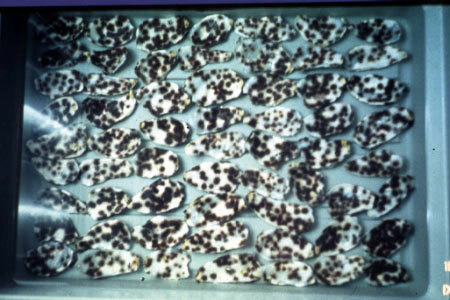 The shells are kept about 5 months in indoor tanks and the Conchocelis- phase plants soon become apparent as greyish-purple spots. At the Seedling Centres (above), nets of synthetic fibres 2-3 mm in diameter and 18.3 m long x 1.5 m wide with a mesh size of 15 cm square (unstretched) are used for seeding. The most common seeding mechanism used at present is to place the nets on drums 1.5 m in diameter and 2 m across driven by an electrical motor at 2 revolutions per min. 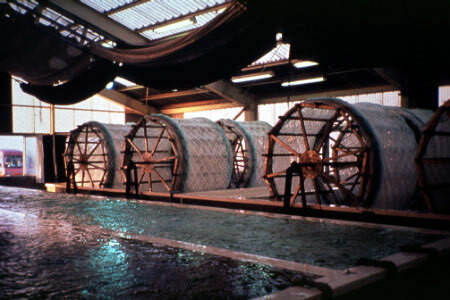 These are dipped into concrete tanks about 7 x 6 x 0.5 m deep to a depth of 0.25 m. About 30 nets are wound around the drums at a time and sporulating Conchocelis- phase shells are placed, still attached in strings, on the bottom of the tanks. The rotation of the drums keeps the water sufficiently turbulent to stop the conchospores from settling on the floor of the tank. It takes about 20-60 min to seed the nets in this way. The fibres of the nets are examined microscopically to ensure that a sufficient number of spores have settled. One Seedling Centre may seed up to 20,000 nets in one season. It takes about 10 shells adequately to seed one net. 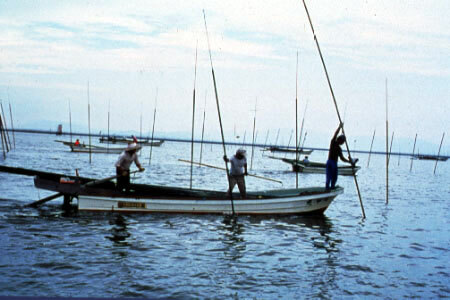 Until relatively recently, the seeded nets were placed in the sea as quickly as possible, but in recent years various methods of storage have been evolved as this allows the farmers to extend the growing season by using two successive sets of nets on each rack. For short-term storage, nets are kept in concrete basins in seawater but in the longer term, cold storage is needed. Provided the nets are folded and covered with polyethylene sheets to keep them moist they can be stored in cold storage for several weeks. Young nori plants can also be kept at -20°C if they are first air-dried to 20-30% moisture (top). They can be kept for more than 6 months using this method, which has the added advantage that contaminants such as diatoms are eliminated. Racks are built before bringing the nets to the Seedling Centres. Well-sheltered sites are chosen, preferabley with current speeds of about 30 cm per second at full tide. The racks consist of two rows, each of nine long bamboo poles which are driven into the sea bed using a power pump and a rubber hose, which forces water at pressure through a nozzle. The poles are placed so that a stretched net fits precisely between them. Usually, four or five such rows are placed next to each other so that most of the poles serve two nets. For five nets only 54 poles are thus required. 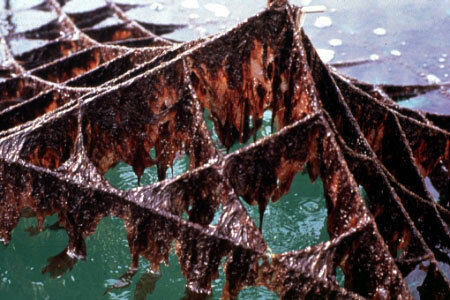 On ground that is unsuitable for rack building, floating rafts are used, but nori plants need to be exposed to the air from time to time, especially during the first three weeks of being put into the sea. Floating frames, 18 m long, made of plastic tubing are used for this purpose. Up to 20 nets can be attached to a single frame. 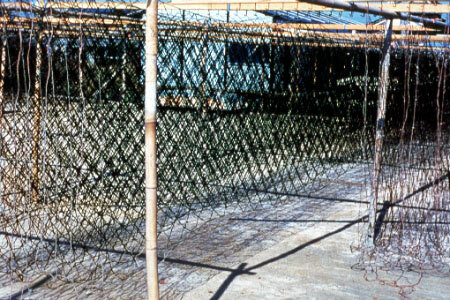 Having been brought to the site, the frame is slotted into the raft in such a way that the nets are exposed to the air for at least 2 h every day. 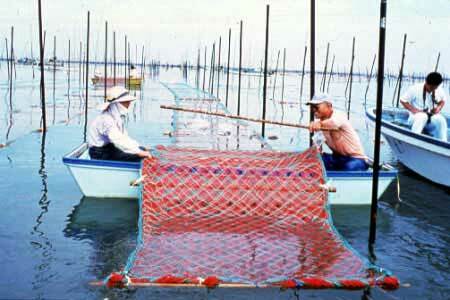 Rafts may be constructed of a light bamboo framework which allows the nets to be attached directly to the frame. Styrofoam floats are placed under the framework when it is necessary to lift the plants out of the water. Nylon frames, anchored to the seabed at the corners, are also used and supported by floats, but a plastic subframe has to be used to lift the nets out of the water when necessary. In the first month the fronds grow slowly but, once they reach about 1 cm long, growth to 10-15 cm can take place in a tidal cycle of 15 days. About 50 days after seeding the nets the fronds are 15-20 cm long. During this period the plants are particularly susceptible to disease and factors such as water temperature and salinity have to be carefully considered and the nets should be lowered and raised to fit in with the tidal cycle. The selection of a site for nori farming is of crucial importance. Where there is not enough shelter, the Pacific surf may cause a lot of damage, especially when the fronds are fully-grown. Some rain is an advantage, since it brings nutrients via run-off but low salinities can be deleterious as this reduces the plants' resistance to disease. Generally, there would not seem to be any serious problem from herbivores but fouling species such as the green algae Enteromorpha and Ulva and certain diatoms can be troublesome. These can be controlled to an extent by careful manipulation of the levels of the nets but care has to be taken to avoid drying out the nori completely. 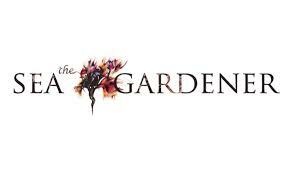 About 10 different diseases attack the nori plants including bacteria, viruses and fungi. The usual remedy for these diseases is to select a level for the nets that optimises the resistance of the plants but is not favourable to the survival of the pathogen. Since growth is faster at depth, the farmers are inclined to lower the nets, but they are aware that disease will strike more readily if this is done. Cross-breeding of strains to find resistant types may prove successful in the future. If disease is observed in the crop, great care has to be taken in washing and drying of the nets or a reservoir of infection could be built up. Nori is not sold in the fresh state but is immediately dried into sheets. This was formerly carried out by a laborious sun-drying process, but the job is now highly mechanised. The harvesters only take what they can process in one day. 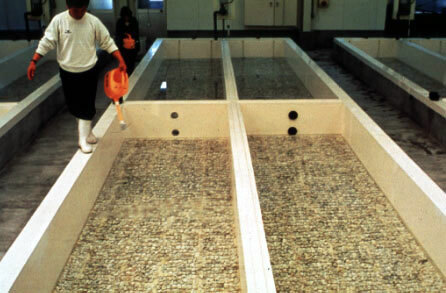 The nori is first washed with freshwater then fed into a shredding machine which reduces it to pieces 0.5 x 1 cm in size. The cut nori is then thoroughly mixed with freshwater, 4 kg of nori per 100 litres. 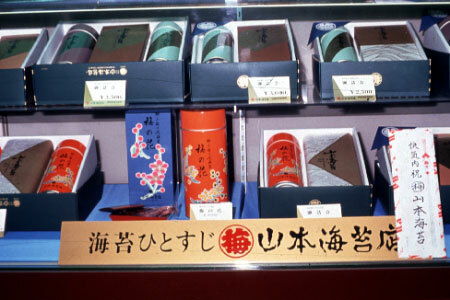 This nori/water mixture is then fed into a machine which rather resembles a paper-making machine; it is metered automatically on to wooden frames about 30 cm square on the outside, into which fits mats of split bamboo 20 x 18 cm in size, and placed over a wire netting screen. About 600 ml of the mixture is fed into each frame and the water drains away through the mats and the screen. The frames then move slowly along a production line and finally over a heated surface. The nori and the bamboo mats are then removed and the frames return in a circle for more nori-water mixture. 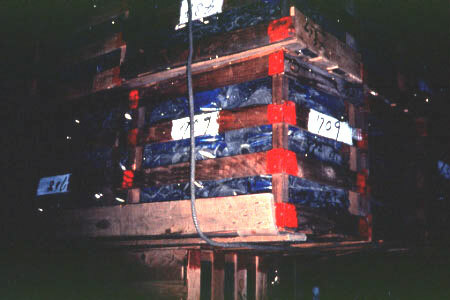 The nori sheets are then piled up and put into an oven to reduce the moisture content to about 18%. 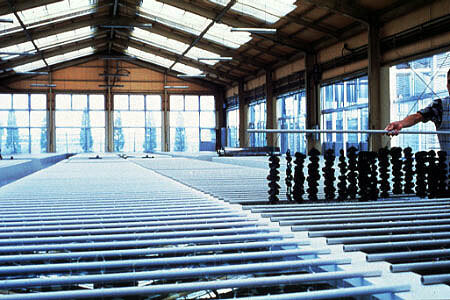 In order to obtain a good-quality product, the temperature of the drying process should not exceed 50°C. The bamboo mats are then removed, the nori is put together in 10s and packed in bundles of 100s. They are then shipped to a co-operative shipping point. Here they are carefully packed and sealed in cellophane so that moisture uptake will not reduce their quality, and shipped to all parts of Japan. The total Japanese output is about 7 billion sheets. Korean production is 60-100 million sheets. 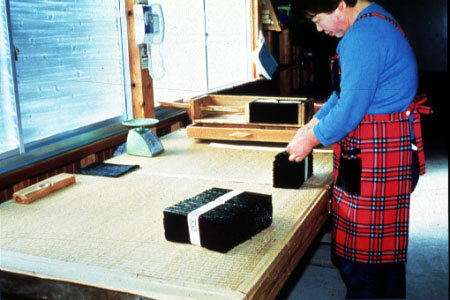 There is considerable government support for the nori industry in Japan. Extensive basic research was funded in the 1960s and 1970s and a network of scientific advisors was set up. The Seedling Centres charge a fee for the seeding of nets on a per-net basis but it appears that this does not cover the entire running costs of the Centres. The local co-operative collects 3% of the annual yield from each nori grower as payment for the use of the farming plots. Equipment such as boats, cutters, washers, sheet-making machine, and dryers all have a limited life of 5-10 years. Nets, ropes, frames, and rafts last 2- 3 years. All this has to be costed in the operation and it must be borne in mind that nori farming is strictly seasonal and most farmers rely on fishing as their main source of income (about 60%). About 35,000 people are employed in the nori industry in Japan, a figures that respresents a decline from a peak of about 65,000. Most of these are organised in small family co-operatives and nori is an important part of the rural infrastructure in Japan. Site © M.D. Guiry 2000 - 2019. Important copyright notice: all text, design and photographs on this site are copyrighted by M.D. Guiry unless otherwise stated and all rights are strictly reserved. Click here for copyright information and contact. Website design: 249 Design Studio. Site maintained by M.D. Guiry (michael.guiry@nuigalway.ie). There have been 8709196 page loads since 1 January 2014 on 19 April 2019.